Map Description A futuristic city. Most i mentioned with mako goes for this map as well. i like the layout, very dynamic, everywhere to go, almost no place to hide. im sure people will cry about the lighting, becouse in most places its pale..
a more realistic feel that fits the map, maaaaaaybe some more color in some spots, but im not bothered, this map has a layer of eyecandy with toppings and a bottom of gameplay. But again: id like to see more moving objects.. awesome machines, maybe vehicles..
al in al, mako and coldcity have something simmilair, but at the same time, are totally different from eachother. The feel of the deco was good but I'm leaning a bit towards it being overdone. ....good layout in my opinion. Also, it runs really well. EDIT: Bot_Deform, maps should always be looked at with gameplay in mind first, and visuals second. Surely the custom textures/meshes look awesome, but the lighting is something I just don't care for, and along with a hitscan dominant and too simple layout I rate it lower. Style does not dictate score for me, nor should it for anyone. This is a great looking map, awesome custom material and in my opinion a good layout I like it. Hmm,had to try it since you were the one who made FactorZ,and even back to unreal1 mapping. 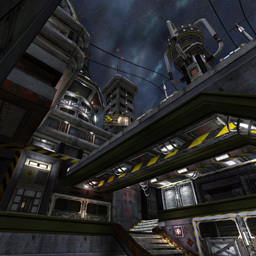 I don't like this map,too fricking bright,too open,not my style of gaming. The biggest only worst thing about this map is the lighting,I totaly disagree about 8's and 9's. As a matter of fact,why don't you redo FactorZ for ut04,mabye don't even scale it up,I wish your original was a tad smaller,just a suggestion,but I think it would be a great level for ut04. Yes it is true that layout should come above all else, but I know how hard it can be to created a map mainly out of mesh, and still create a good layout. Redfist is a nice suggestion but atm i prefer to make new maps :) although i could make it some day. Of course, reminds me on DM-Mako, which I recently played. About the theme, it's awesome, but such bright lighting in addition to the yellow textures and so much detail is too distracting and makes fragging harder. It's worth mentioning all the masterful work that N3oDoc has made, even designing parts of the map where playes aren't able to go... Good job! Nice and fresh design, better than your brothers even, and at least you had the sense to BETA test it before release, however a mini-gun ammo somehow wound up inside the floor. No big deal it has enough area around it that it can still be picked up and it works it's just half way buried in the floor brush. I like the size of the map and the openness. Weapon placement is OK too, they bases are a bit far from the player starts but the size of the map seems to make up for it. At least with the BOT load you have set. Looking forward to playing it on line. I like your meshwork :), the layout is good for me so keep up the good work! Nice work - solid map & fun to play. 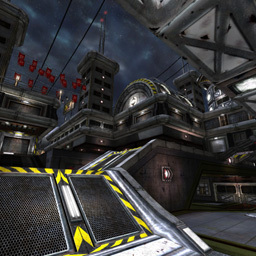 Arggggg... Looks so nice, loved cityzen by the way my favourite map for a while. Great gameplay and stunning looks = ownage. Nice work. This is a greeat map, with some rally nice mesh-work and a desent gameplay. I have one tip though,I think ut would have been better looking with some kind of 'dept' in the background (i mean buildings that stand behind the building that are in teh map now), wich might add to the realism. Overall a very nice map and defenatly worth downloading. but just like with your brother's DM-Mako the lighting is too grey imo. gameplay is pretty nice and the meshwork is just excellent. Man I love the custom content in this baby! You really pulled off making a 1on1 style DM look like it's much bigger than it really is.Somehow it feels like you're playing on the set of a Final Fantasy game. 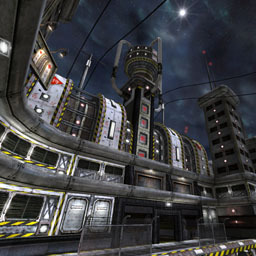 Compared to most 1on1 capable maps, it's much more expansive and surreal. I'd love to score higher too, but imho the lighting is a bit saturated and overly contrasty. It makes even brightskins a bit tough to see. -tweak the lighting a bit so it's not so harsh on the eyes. I think it would really help sell the depth of the environment more, make it 'seem' even larger than it does already. -change the death message that appears when someone tries to go over the barb wire fence. Maybe something like, "%t tried to wander off and die alone." ? Oh before I forget, awesome work on the optimization! For all the detail this baby ran smooooth!